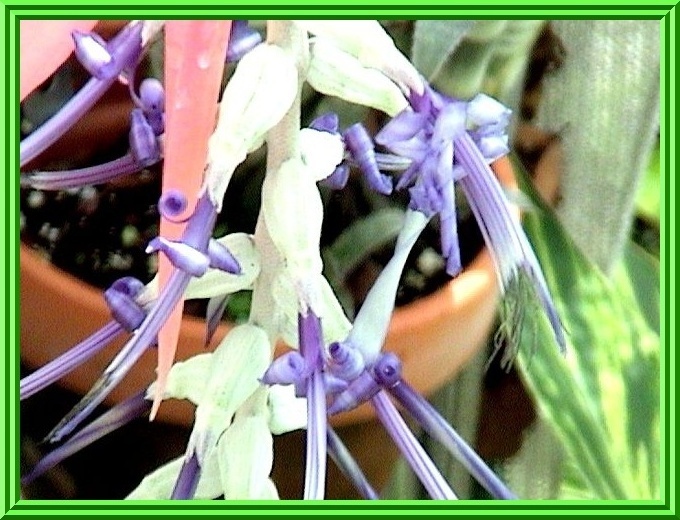 This Bromeliad is named after the Swedish Botanist, Gustave Billberg. There is only one drawback to this bromeliad, the flower only lasts a couple of weeks. Besides the short lived inflorescense (flower), what is most attractive about this family is the foliage and shape of the Billbergia. These characteristics make up for any short-term flower they may have. Their shape is mostly tubular and the foliage can be banded... cross bars... spotted and blotching. 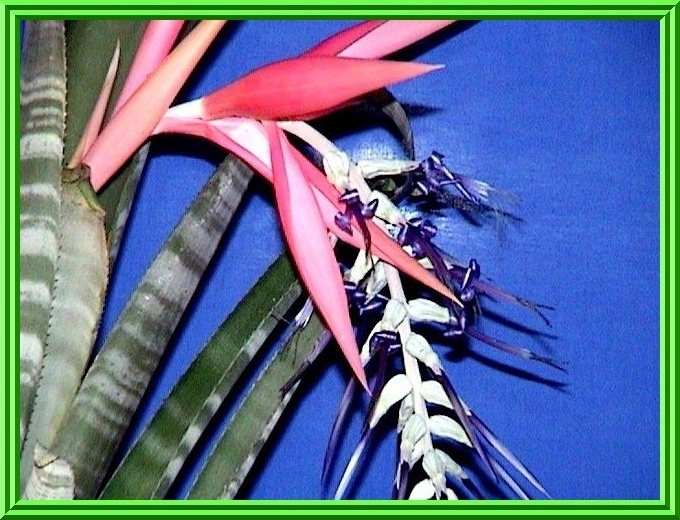 About half of the billbergia species are epiphytes, the rest are terrestrials that grow on the ground. The root systems are normally small and serve to anchor them to tree branches or rocks. Most of the functions of water and nutrient absorption has been taken over by the leaves. The leaves often form a reservoir that collects and holds water, these are called 'Tank Bromeliads'... those that don't hold water are known as 'xerophytic' or atmospheric (epiphytes only) bromeliads. Billbergias need high light levels to develop good color and form. Too little light and the erect leaves become excessively long and could break. Outdoors or in a greenhouse, 50% to 65% shade cloth is best which translates to 3500 to 5000 footcandles. They can adapt to almost 9000 footcandles (almost full sun) with high humidity. Billbergias tolerate extreme temperatures, they are not damaged by several degrees of frost or periods at 115 degrees F. For specialists, the helicoid group suffers below about 40 degrees F. At very high temperatures and very bright light, foliage color and contrast fade. No permanent damage is done as color returns with moderating temperatures. Follow basic bromeliad culture. 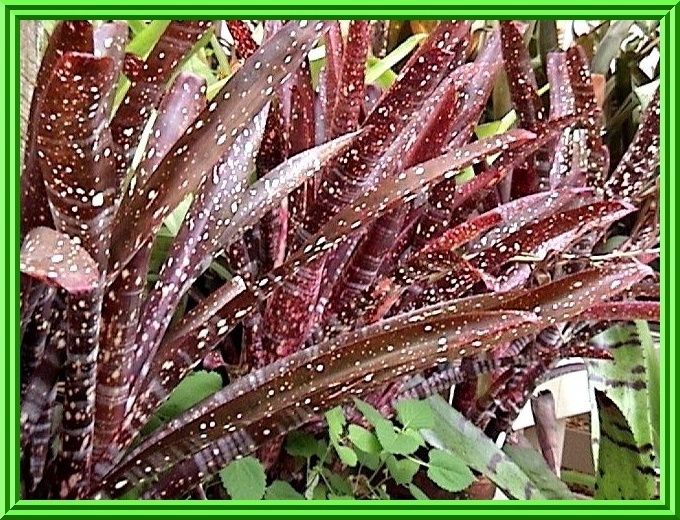 Over-fertilizing ruins the foliage color and plant form and they will produce elongated leaves that are prone to break. This family came mostly from Brazil and grows on rocks... trees... and on the ground. The average size is appx. 16 inches or less, though some have been seen in the two to three foot range.